St Cloud Florida is about 5 miles east of Kissimmee on U.S. Highway 192. Much of the business activity in both towns is centered along this highway. The average tourist staying in the area and mainly interested in Walt Disney World, Universal Studios and the other big attractions will hardly be aware of the real St Cloud. It is only when you get off the highway and go into the town that you will be able to enjoy the small town charm. This town of 35,000 people is on the south shore of East Lake Tohopekaliga. Most local folks call it East Lake Toho. It is a round lake about 4 or 5 miles in diameter with marshy shores known for its good fishing. 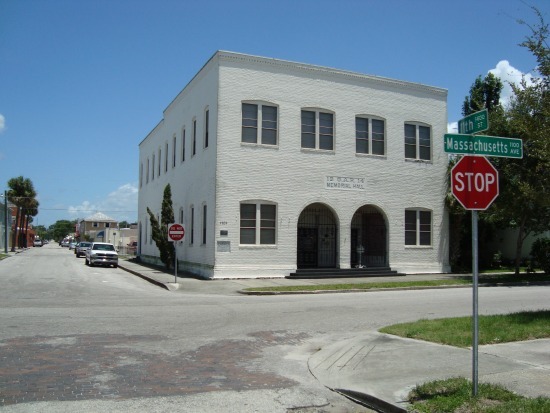 The historic downtown area and City Hall are 4 blocks north of U.S. 192. Pennsylvania Avenue is one of the main streets leading north into downtown. Most of the historic old buildings in St Cloud are along 9th and 10th Streets. Hamilton Disston of Philadelphia bought 4,000,000 acres of Florida land for $1,000,000 shortly after the Civil War. The State sold the land to help pay off its Civil War debts. It was claimed at the time to be the largest private land sale in the history of the world. Disston was also to receive a percentage of additional land if he could drain it. He began to dig canals around St Cloud and Kissimmee, and in 1886 he built the St Cloud sugarcane plantation. Some locals say he named it after the town in Minnesota; others claim he named it after the town in France. Disston build railroads to haul his products to market, but the Great Freeze of 1894 and 1895 destroyed the plantation. Others tried to raise rice on the plantation, but that didn't work either. So the land lay unproductive and lonely for many years. 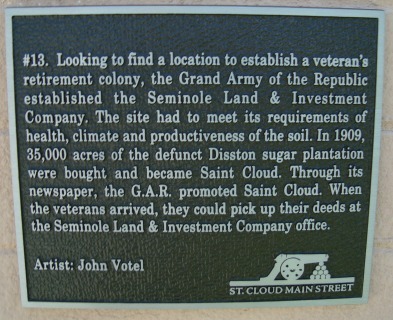 In 1909, a development company bought 35,000 acres for the site of a Grand Army of the Republic veteran's colony. The Grand Army of the Republic was a huge fraternal organization formed in 1866 and composed of veterans of the Union Army who had served in the Civil War. The town was laid out on the south shore of East Lake Toho. Many of the north-south streets were named after the states from which the Union Army veterans had served. This heritage has been retained in the street names of today. St Cloud, Florida was incorporated in 1915, and the downtown areas still features historic old buildings from that era. In addition to the interesting downtown section, St Cloud has developed a beautiful park on the south shore of Lake Toho. The park includes walking and biking trails and a nice marina. The town has abundant large trees including many ancient oaks. 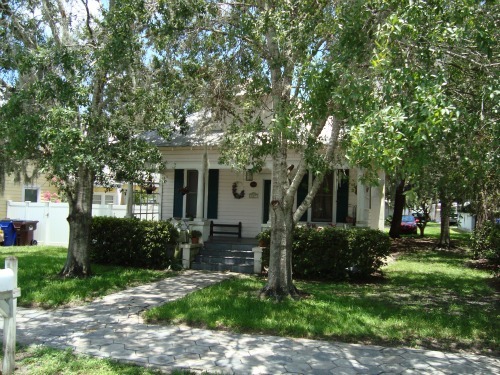 There are all kinds of homes that date back to the boom days of the 1920s; many of them have been fixed up and are as charming as any homes in the State of Florida. Many of the old buildings in the historic district have been decorated with murals of historic significance. Each mural has a plaque that describes the moment in history portrayed by the mural. For many years there was a lighted cross on the top of St Cloud's water tower on the south side of the main drag, U.S.-192. It was a landmark that many Floridians enjoyed as they drove through town. The cross was an obvious symbol of the first name of the town, SAINT. Then in 1987, the ACLU filed a lawsuit on behalf of a resident who objected to the cross. The lawsuit said the display of the cross was unconstitutional because it promoted one religion and was on city property. The City tried to compromise by replacing the old cross with a Greek cross; it didn't work, the ACLU prevailed and the cross on the water tower is gone forever. St. Cloud is on US-192 just east of the Florida Turnpike. It has not been turned completely into the fast food megatropolis that its neighbor Kissimee has become due to the arrival of Walt Disney World and the other major theme parks. St Cloud still has a bit of a country feel, and The Catfish Place fits right into that feeling. I've been visiting The Catfish Place since it opened in 1973. You won't be surprised to learn that this restaurant features seafood, and especially catfish. Their catfish is reportedly delivered fresh daily from Lake Okeechobee to the south. It certainly tastes fresh, and I've never been disappointed in the quality or quantity of their meals. The interior decor is Florida country. You will see a big tank with fish of all kinds and sizes swimming around. If you are like me, you hope that one of those big finny guys giving you the fish eye will not become your dinner. Walls are decorated with murals showing scenes of cattle ranching, hog hunting and other staples of Florida Cracker culture. The entire impression is of a large friendly family oriented home style restaurant, and that's certainly what The Catfish Place is. When I find something I like at a restaurant, I get in a rut and usually order it again and again. The Catfish Place is not exception. Although they have a wonderful selection of Florida Cracker food such as gator, turtle, flounder, shrimp and other delicacies, I always have the "all you can eat boneless" catfish platter with salad, hushpuppies and the vegetable of the day. My favorite is corn on the cob, but they also quite often have turnip greens. The catfish is served lightly fried and is in small "finger" size portions. The original and one refill is usually all I can handle, and I'm a big eater where fish are concerned. 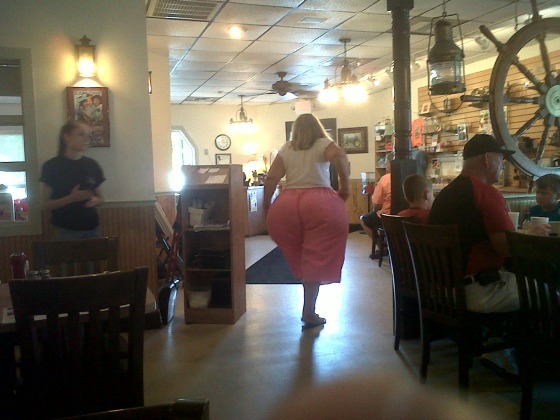 Big eaters are never disappointed at The Catfish Place. Beer and wine are available to complement your meal. The Catfish Place is open Sunday-Thursday from 11am to 9pm, and on Friday and Saturday from 11am to 10pm.